Originally released exclusively on WiiWare in 2009, Swords & Soldiers has had its fair share of ports in the five years since its initial release; it's made an appearance on almost every platform under the sun. The last of these to grace a Nintendo platform, the 3DS version, was not exactly a shining example of what one would call a "good port", but now the game has appeared on the Wii U — no doubt timed to prepare people for the sequel that is currently in development. With one disappointing handheld port already down for Nintendo gamers, the question is whether this Wii U entry does the original greater justice. 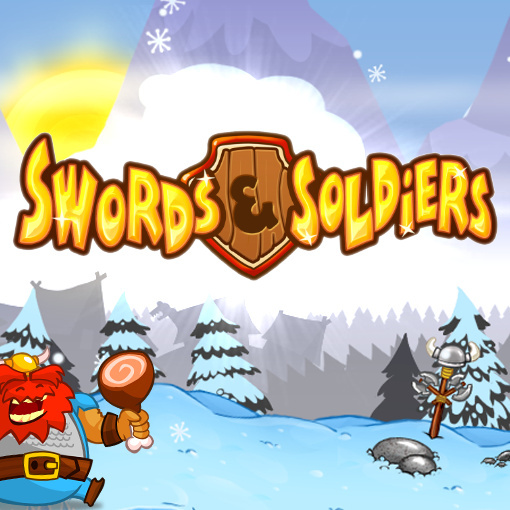 For those still to play the title, Swords & Soldiers is a simplified real-time strategy (RTS) game. This means that unlike games such as Advance Wars and Fire Emblem, it's not turn-based — you don't get as much time as you want to carefully consider your options and make the right moves, everything will instead keep moving as you think and act at the same time. As you'll frequently need to decide between increasing your income, buying more units or researching new features, you can imagine things can get quite hectic. Swords & Soldiers further differentiates itself from most other strategy titles by not having a bird's-eye view, but rather taking place entirely on a 2D plane where your units will also move automatically — you only click on some buttons to decide what units you want to buy; when they enter the battlefield afterwards, they'll mindlessly plow forward and the only thing you'll be able to do to interact with them is assist them with spells. While you can look around the level with the analogue stick, there's a convenient, simplified map at the bottom of the screen which you can tap to instantly jump around to different positions, great if you need to move up to the front lines quickly to dish out some magical punishment. 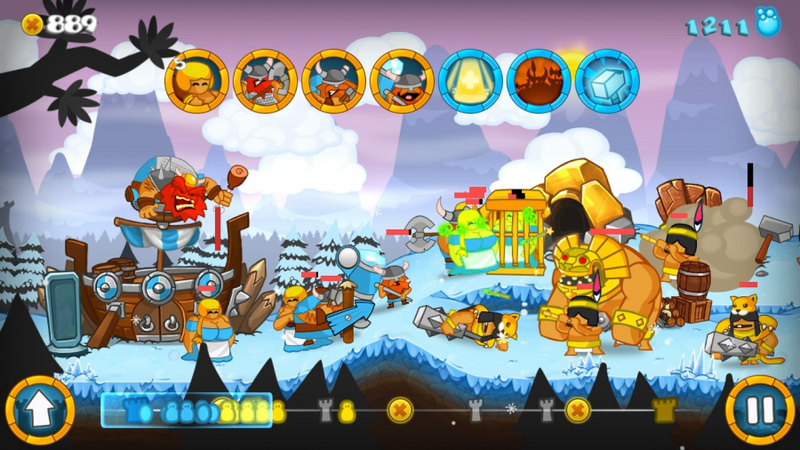 Although the Vikings tend to be the poster boys for the game, you can actually play as three completely different groups, each with their own unique units and spells. 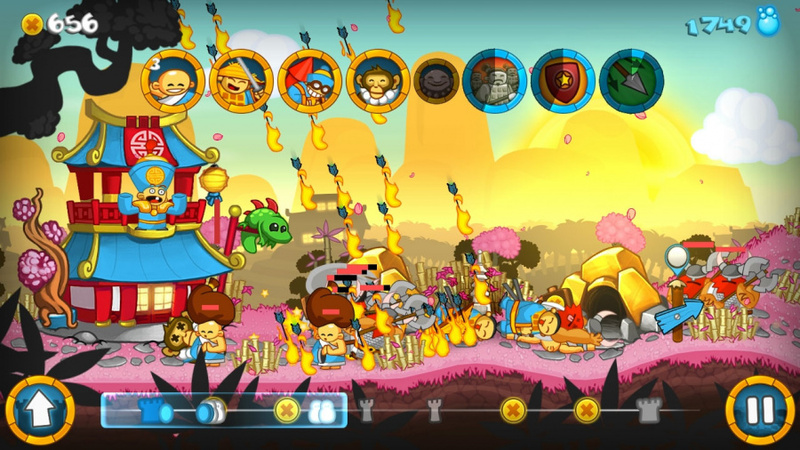 While the Vikings, for instance, have axe throwers and a healing spell, the Aztecs have poison dart blowers and cage traps, while the Chinese have ninja monkeys and a shield spell. Although each group's units tend to fulfil the same basic roles (Melee, ranged, and stun) the way each of them operates is vastly different; certain units will completely outclass others, making it vital to adjust what units you're pumping out in order to counter the opponent. If you're not sure what certain units or spells do, don't worry, because each of the three tribes has their own single-player campaign, teaching you exactly how to master them. While the first few missions are quite easy, there are a few challenging ones in the bunch, especially if you're going to try and unlock the game's numerous achievements, some of which require you to perform certain feats in certain missions. The storyline isn't very serious, so expect plenty of jokes! As you progress through the campaigns, you'll also unlock three challenge modes to sink your teeth into, each themed after one of the groups — these can be a fun way to waste some time. If you're still left wondering about certain things after clearing the campaigns, you can also set up a skirmish match against the AI to further improve your skills. In the original WiiWare release, all of the gameplay consisted solely of clicking on things on the screen with your Wii Remote's pointer. The 3DS port logically (but unsuccessfully) moved all of this interactivity to the touch screen and had you use the stylus, but for this new version Two Tribes clearly wondered "why not both?" Indeed, both control types are usable this time around — if you're playing with the GamePad, you can tap things on its screen, but if you've opted to play with a Wii remote you can play the game exactly the way it was in 2009. While the game has made the jump to Wii U in much the same shape as its original release, some features from ports in-between have unfortunately not made the cut — while there is multiplayer, it's offline only, so you cannot literally try to conquer the world. One key bonus point of that local multiplayer, however, is that you can each have a full screen, with one focused on the GamePad and the other using a Wii Remote and the TV. Also missing is the "Super Saucy Sausage Fest" DLC, which included an entire extra campaign; at the time of publication we've been told by Two Tribes — which has produced this version — that it wants to add this DLC but it's dependent on sales of the game. A major positive, though, is that this is perhaps the nicest-looking version of the game yet, with clean, crisp HD visuals on both your TV and the GamePad. The touch controls, which were not so hot on the 3DS, now work perfectly, with the alternate choice of pointer controls if you so desire; it's all topped off by a very attractive price. Also, don't worry, the great soundtrack has also made the jump completely unscathed. What I'd like to know is if they've fixed the last level so it isn't impossible any more. There's difficulty curves in games, sure, but in the Wii original this was like a gentle incline throughout the entire followed by the final level - a vertical wall twelve miles high. With spikes on it. And ninjas. Yes to 2 player co-op using the gamepad! Each player having their own screen is a fantastic idea. Im looking at you,Mario Kart 8. What is better? This or Castlestorm. I love Castlestorm. @shigulicious Agreed. Two player gaming with one on the gamepad is one of the best things we could wish for. I'm still hoping mario kart will have that in an update soon. How does it compare to castlestorm? I have played swords and soldiers and loved it, but am wondering about castlestorm because of this. @shigulicious indeedm hyrule warriors has the same way of 2 player co op, one on the gamepad, one on the the screen. Don't know why they didnt use it on mk8..
Was going to get this anyway so this review hasn't changed my mind. I would like to try out Castlestorm at some point as well, but I'll grab S&S for now and get Castlestorm if/when it goes on sale. I will be triple dipping because of the price alone. Its like a bonus for owning the others! @Nintenjoe64 They're both very different as far as gameplay wise. 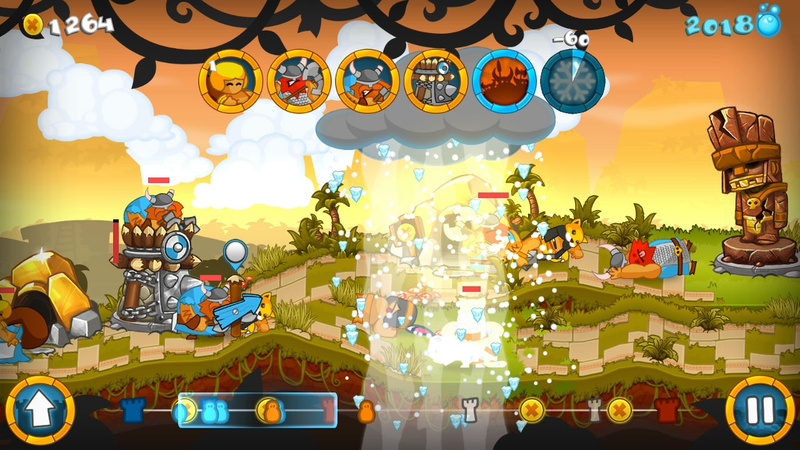 In Castlestorm you have much more control over weapons and such. Both are great fun games though but for the price this game is highly worth it. CastleStorm is one of my most favourite Eshop games it's got hell alot content not mention DLC. I had S&S on my Wii long time ago and it was great! It does have very attractive price point and HD. But there should of been little sumthing more to warrant me buying it again. Which there isn't I'd say get castleStorm and if have any extra penny's laying around get this to. I love the wiiware version. I don´t know if download this game again. I use my wii and wii u a lot daily. yep, it reminds me of a game I played on my android phone, can't remember the name, but had the same mechanics which I liked and this looks much better, so I will be getting this. The 1st time I played this game the last level took me literally 3 hours, I remember b/c I missed dinner. The next 2 times (I played on easy, normal, hard) it was the same 20 minutes or so as all the rest. The key is to save the dragon for the gold miners. 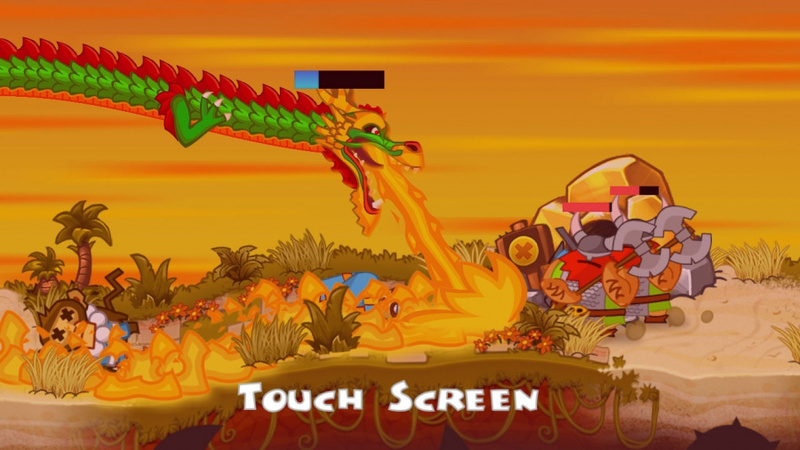 Buy the dragon, save up mana, use the dragon twice to kill all the gold miners - you have to save the fire until the end - level over. I also played this on PS3 w/ and w/o Move, and an Android tablet, and it always works the same. If this game had the DLC - which I never even knew existed - I'ld buy it again, but I'm worn out. Will buy the sequel day 1 though. Is the multiplayer local co op or just local versus? I don't think the reviewer specified. 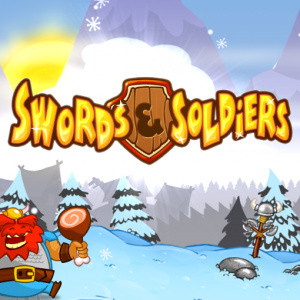 @Nintenjoe64 From what I've played of Castlestorm, Swords & Soldiers is much better. @erv "Agreed. Two player gaming with one on the gamepad is one of the best things we could wish for. I'm still hoping mario kart will have that in an update soon." Don't get your hopes up. The reasons behind that not being available in MK8 are technical (hardware specs) as much as anything else. @erv @ScorpionMG I think MK doesn't use it because of the raw graphical capacity that would be required, given how much MK8 pushes the hardware. Split-screen requires two scenes to be rendered (one per player viewpoint), but at only half the vertical resolution per scene. Moving one display to the gamepad would require rendering both scenes at maximum resolution, which would be much more intensive. Game like Hyrule Warriors and this can render on gamepad and TV at the same time because they aren't pushing the hardware as much, so the actual rendering is much cheaper. 'Ported correctly' was all I needed to know, sold! Thanks for the prompt review, excellent as always! 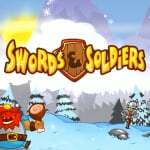 sword and soldiers an awesome game i recommend it for anyone who never played. @Nintenjoe64 going by the Wii Ware original, this is much better than Castlestorm. Much higher quality. It's a fantastic game, not sure I want to double dip though. But I remember being very satisfied when I beat it. I love to see a good, solid eShop game done right, ported right, and priced right. great review and a great port more eShop games should be like this. I have Castlestorm and its reasonably fun. This game costs less than a pint so i may get it on the price basis alone. I love castlestorm, but can't play at the moment due to a broken thumb. Given that this is touch or pointer only I think I'll pick it up to fill some of the six weeks with a cast on, gonna pick up the curse of monkey island wiiware games aswell sinse there's no sign of a Wii u version like I hoped for!! Do my eyes deceive me? Only 3 Euro's?! At that price even I might download it! @Reuf excellent. Once Scram Kitty is complete I'll get on it. Thanks! @SanderEvers At the price they are offering it, can you really say "NO"? Apart from that, the DLC is dependent on game sales, and also the sequel could depend on the same. I urge everyone to purchase this game, and support Two Tribes for their continued faith in the Wii U. Didn't know this was the first game. Still want it, though. Would you suggest this game for someone who loves games like Advance Wars,Fire Emblem etc. Really nothing more then a OK game. 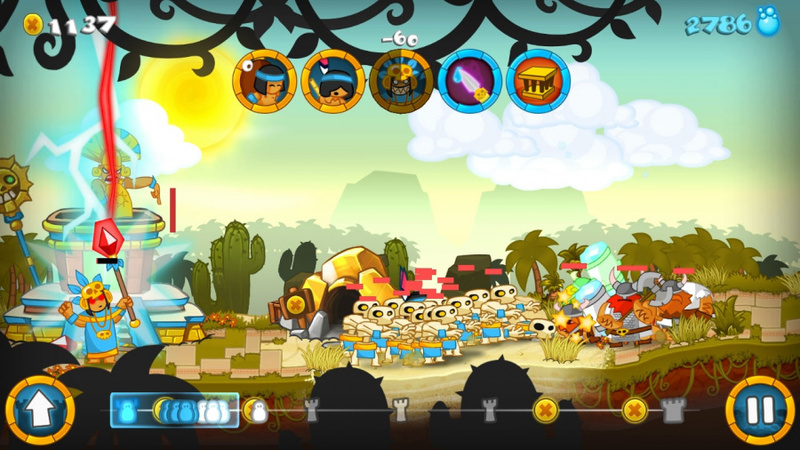 Reminds me of flash games like burrito bison or Kingdom Rush, or any other fine flash game. plays like one too except a little more smooth in terms of gameplay.The wiiU's gamepad makes things a lot more fun.